Walking down the streets of Albania you could be fooled into thinking that the place is chock-full of American name brands. But you’d be wrong. If you look closely, nothing is what it seems. The name on the storefront may say “Apple Inc.” or “Subway,” but I promise that once you walk through the doors you will be in unfamiliar territory. The Apple Store sells regular pc computer, Subway sells byrek (Albanian snack food kind of like pie), the Adidas store sells Nike shoes, and the Polo Ralph Lauren store sells Burberry and Tommy Hilfiger knock-offs. At first I was so confused as to how the stores could literally print the exact same logo from an American company, post it outside their store, sell whatever they want under that name, and now have a lawsuit. But then I realized that I was thinking like an American. In this country, the legal system is almost non-existent. No one will sue you for fals advertisment or copyright infringement. 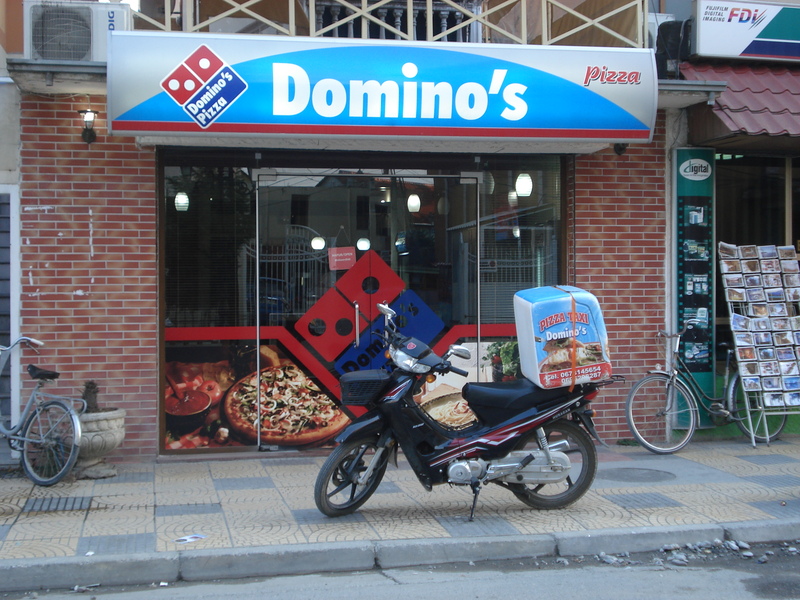 And no one in the U.S. probably even know that little Joe-Schmo down the street in Shkoder is using the Dominoe’s logo to sell his pizzas. Even more ironic, is that it’s not like these stores get more business because of their American sign fronts and logos. Albanians don’t even know what Subway and Dominoe’s is, so they aren’t fooled into associating the two, I promise you. So why do they do it? These stores are usually started by the child or relative of a local Shkodran who has been outside the country, seen these labels, and thought it would drum up some foreign business if they used an American name. So maybe it works on the few foreigners who pass through Shkoder for an exotic vacation. But for the most part, it’s just a tease for the volunteers living here to walk by fake McDonald’s arches every day and not be able to walk in and order a Big Mac. same in korea! copyright laws just don’t exist. logos, books…. anything is fair game.